THE appointment of Garry Nkombo and Jack Mwiimbu as Chief Whip and leader of the opposition in Parliament by the UPND has angered many Members of Parliament from Western and North-Western Provinces who now feel Hakainde Hichilema is allegedly using them to push the political interests of the Tonga-speaking people of Southern Province. And the Patriotic Front (PF) said the appointment of Mr Nkombo and Mr Mwiimbu both of whom hail from Southern Province as Chief Whip and leader of opposition in Parliament has confirmed fears that the opposition political party is a true tribal political organisation. A revolt is now looming against Mr Hichilema by MPs from Western and North-Western Provinces who are wondering why the two positions in Parliament had been offered to Mr Nkombo and Mr Mwiimbu who were both from the same region. The MPs who did not want to be named said the UPND had swept Western and North-Western Provinces and the best the opposition party could have done was to balance the appointments of leaders in Parliament instead of reserving the two positions for one region. 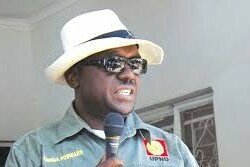 PF Lusaka Province youth Chairman Kennedy Kamba said the appointment of Mr Nkombo and Mr Mwiimbu had confirmed that the UPND was a poisoned tribal chalice and warned the people of Western and North-Western Provinces that they would continue to be used by Mr Hichilema to push his regional political agenda. Mr Kamba wondered why the UPND had found it difficult to fairly share the two positions for the opposition in Parliament when it had the majority of MPs in Western and North-Western Provinces. He said time had come for the people of Western, North-Western and some parts of Central Provinces to wake up and begin to see the UPND as a political party meant for the Tonga-speaking people of Southern Province. “Mr Nkombo and Mr Mwimbu are MPs from Southern Province and the two have been appointed Chief Whip and leader of the opposition in the House respectively. The UPND swept Western and North-Western Provinces but Mr Hichilema cannot see anyone suitable from the two regions who he can entrust with the position of Chief Whip or leader of the opposition in Parliament. That confirms what the UPND is…a tribal political organisation. The UPND president is Tonga and so is the Chief Whip and leader of the opposition in Parliament,” Mr Kamba said. Mr Kamba advised the people of Western and North-Western Provinces including Geoffrey Bwalya Mwamba and other non-Tonga speaking people that it was time they realised that the UPND was not representing their affairs but those of the people of Southern Province.